The tallest Shiva statue in the world, constructed on the financial support of Kamal Jain, is complete and is open for worshiping. 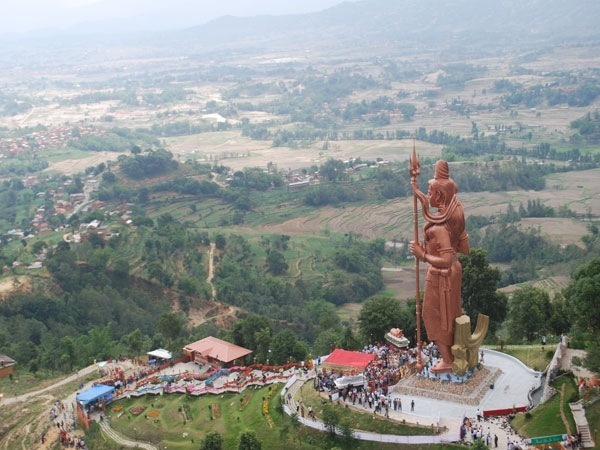 The statue is constructed at Chhitpol-5, Kailaskut hill in Bhaktapur. During the unveiling, a helicopter of Fishtail Air was throwing flowers on the statue from above. The construction took 6 years and involved 100 Nepali and skilled labors from India. The construction of foundation alone took two years. To protect the statue from natural factors like sun, wind, and rain, it is coated with zinc. It is further coated with copper on top of zinc coating. According to Kamal Jain, the outer cover of the statue contain 6000 kgs of zinc and copper. The statue is 108feet tall after the holy number ‘108‘ in Hindu mythology. When the foundation of 36 feet is added the total height of the statue comes to be 144 feet. As much as i know, the builders don’t claim that it is the tallest statue but , yes they do claim that it is the tallest lord Shiva statue in the world and the tallest Hindu religion statue. This entry was posted in Records and tagged Bhaktapur, Kailaskut, Kamal Jain, Shiva, Tallest statue. Bookmark the permalink.